Are you searching for a perfect mid afternoon treat? 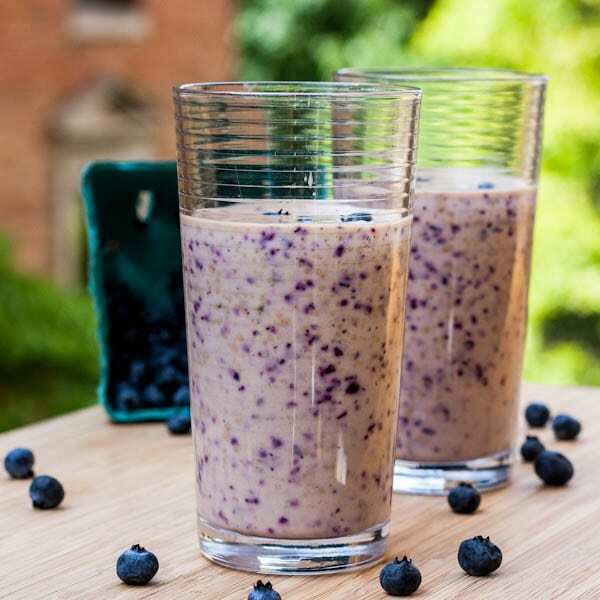 Check this Blueberry Banana Yogurt Smoothie Recipe, it’s both healthy and delicious! This is my first time participating in the Secret Recipe Club where each month you are assigned a food blog and on the selected day you are to post a recipe from that food blogger. This month’s I was assigned Lynn’s blog from Cafe Lynnylu. She’s had the blogging running since 2005 (wow) and aside from numerous recipes also features beautiful photographs. I bookmarked a lot of recipes from her site but ending up selecting this blueberry banana yogurt smoothie recipe for the SRC. There was a lot of choose from but I had to narrow it down to one recipe! I don’t make smoothies nearly as often as D would like so I knew he would definitely appreciate a Sunday afternoon fruity blueberry banana yogurt smoothie. A fair reward for his Whole Foods outing to do the grocery shopping for the week. Most of the ingredients in this blueberry banana yogurt smoothie recipe are pretty standard; Greek yogurt, blueberries, bananas, but what really intrigued me was the addition of apple juice. Not a regular in the smoothie world, the apple juice really did provide a subtle hint of appley goodness. Luckily I had some fresh apples laying around so I just made fresh squeezed juice to add to the smoothie. Not sure how this would work with bottled juice but it’s definitely a welcome addition when it’s freshly made. I did especially love that this recipe combined both fresh squeezed juice and blended fruits and berries. I love fresh squeezed juice but the problem with juice is that you don’t get any of the fibers from the actual fruits and veggies – the way you do in a blended smoothie. So I feel like in this blueberry banana yogurt smoothie you’re getting the best of both worlds – the fibers and added nutrients of the bananas and berries with the fresh juice of the apple. Now to continue experimenting with smoothie that have both blended and juiced components. I think this would work perfectly in a green juice actually – with something like kale juiced while bananas and berries were blended — this might be perfect for those who normally find green smoothie a bit too heavy. Overall this blueberry banana yogurt smoothie recipe was a delicious summer drink and a perfect way to celebrate my first Secret Recipe Club post. For a vegan version of this smoothie be sure to use a vegan coconut yogurt instead! 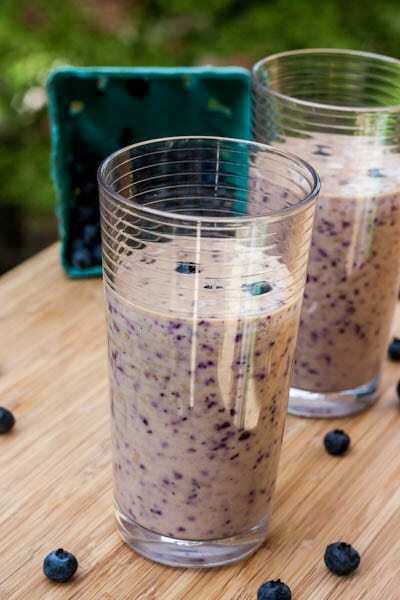 A perfect mid afternoon snack or breakfast - make this Blueberry Banana Yogurt Smoothie asap! Welcome to the SRC! The smoothie looks so tasty and refreshing! Thanks – D the boyfriend fully enjoyed a glass and a half of it! Welcome to SRC! Great choice-my husband loves smoothies and would enjoy this one. Thanks! Smoothie are definitely perfect for the hot summer days! We love adding apple juice to our fruit smoothies here as it is great for my dairy-allergy kiddos! We use soy yogurt instead of the greek yogurt and it’s always a hit! Smoothies are perfect for summer! SO refreshing and a great start to the morning. Couldn’t agree more! If only I could wait up extra early to treat myself to a smoothie before work! Can never get enough smoothies especially is this hot weather. Looks really good. Welcome to SRC. I’m looking forward to reading your recipes on your blog. Thanks! Definitely excited to finally be off the wait list for SRC – it’s always fun to cook recipes from other blogs! The smoothie looks absolutely delicious. I think that the secret ingredient for SRC this month is Greek yogurt. My daughter would LOVE this smoothie. She is a big fan of blueberries. Let me know how it turns out for you if you make it! Great idea to keep the fruits in the freezer to give the smoothies a thicker milkshake consistency! I’ll have to try that next time! And yes this probably would make a killer fro yo too! How cool you got my blog! Your smoothie looks amazing, especially the freshly squeezed apple juice! Welcome to SRC! Thanks for the lovely words. Thanks Lynne, I fully enjoyed checking out your blog this month and have bookmarked a handful of recipes from there to try — I want to make your blackberry frozen yogurt tonight (subbing in blueberries instead)! Welcome to the SRC! Your Blueberry Banana Smoothie looks very refreshing and would be delicious. Great selection for SRC! Thanks! I got the blueberries delivered from a local farm so they were full of flavor and delicious! Thanks! After months of the waiting list I’m glad to finally be in! How did you juice the apple? With my juicer! I got one on amazon a few months ago and absolutely love it! Welcome to the SRC. Your smoothie looks delicious, so healthy and such gorgeous color. Thanks Lisa! Heading over to check out your SRC entry now! Ah.. blueberry the superfood! Looks terrific.. something I could take before hitting the gym! Thanks for sharing the recipe! Thanks! Definitely a delicious smoothie! Thanks for this recipe – perfect for the patio!!! Hope you enjoy it! So good! Blueberries and bananas make a great duo! Thanks! Hope you enjoyed the recipe if you ended up making it! I’ve never used chia seeds before but have been hearing a lot about them! How does one squeeze an apple to juice it? I juiced the apple beforehand in a juicer. Hope that helps!